I've got another before and after for you! 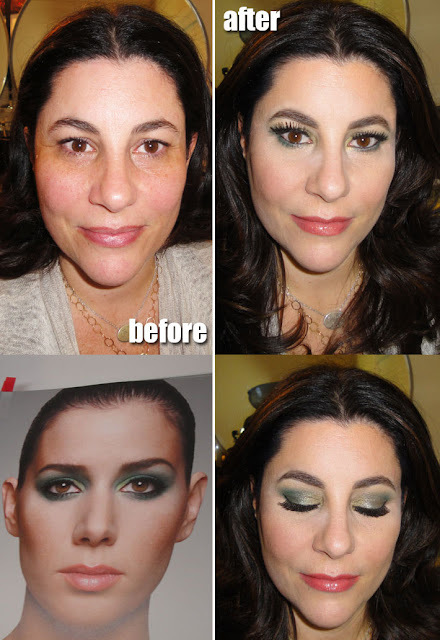 Today I'm sharing a makeover that a client and I accomplished during a makeup lesson. We went for a Nars inspired smokey green look that's super sultry yet wearable at the same time. Check it out! During makeup lessons I do one side of the face step by step and let the client replicate the other. We go over every step from skincare to makeup to setting and finishing. For my clients, I like to use whatever products they own so that they can get use out of their stash. Then, I recommend any products that are needed. We started out with a neutral Brigitte Bardot inspired look then transitioned to a fully smokey green look straight out of her amazing Nars Makeup book. The key when working with clients is to develop techniques that are appropriate to their lifestyle and tastes. My client is a blogger mom on the go so we wanted to show her how to do a quick neutral look but also give her the ability to glam it up when she has an event or a tutorial. Great job!! this is super pretty!